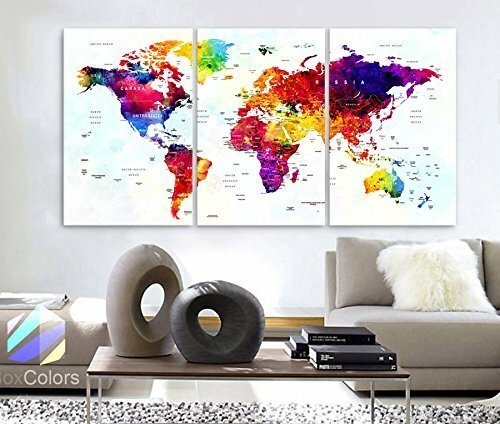 Sold by BoxColors From USA - You will receive the Original Image - Sending from the United States - Made in the United States SIZE: 30" x 60" x 1.5" depth (30"x 20"x 1.5" depth each panel) Type: Giclee artwork, print on the artist cotton Canvas. UV-protective coating.100% cotton. Weight 360gsm Materials :Stretched on a 1.5" wooden frame. The image continues around the sides, and is staple free. Ready to hang! Shipping: Shipping in 1-2 days after your payment and you should receive of 5 to 9 business days Return Policy: We're confident you'll enjoy your purchase. If you're not satisfied please contact me, simply return the canvas print to us within 3 days from receiving it and we'll refund you the full purchased price. If you have any questions about this product by BoxColors, contact us by completing and submitting the form below. If you are looking for a specif part number, please include it with your message.